Planning a football trip to Florence? Free guide – how to get tickets, get to the ground, what to see, where the best places to eat and drink are and where are the best places to stay. Football Trip to Florence – How to get there and How to get about. Florence Airport, otherwise known as Peretola Airport, is located 5Km north west of the historic city of Florence, 85km east of Pisa, in Tuscany. A bus service into and from the city runs approximately every half hour during the day, with a journey time of approximately 25 minutes. A taxi into Florence from the airport should cost around 20 Euros for the 15 minute journey. A number of budget airlines fly to Pisa instead of Florence Airport – You can get to Pisa Central Station from Galilei Airport by PisaMover Bus Service that has a timetable departure of every 10 minutes and operates every day from 6.00 a.m. to 24.00. p.m., including Sunday and Bank holidays. It has a journey time of just 8 minutes. Pisa Airport and Firenze SMN railway station are connected by several trains a day. The service is operating with both regional trains that perform some intermediate stops (including Pontedera and Empoli) taking about 1 hour, and with fast trains that directly connect Pisa Airport with Florence Santa Maria Novella Railway Station in just 50 minutes. Pisa Airport- Florence Santa Maria Novella (SMN) Railway Station ticket price is 7,90€*(PisaMover Bus service + train ticket). Florence’s main train station,Firenze Santa Maria Novella, sits astride the main Rome-Milan line (with connections in Bologna and Arezzo) and is the terminus for two lines to the west: one to Livorno via Pisa and Empoli and one to Viareggio via Prato, Pistoia and Lucca. It is important to know that Florence’s main historic center is relatively small so that it is easy to move around on foot. Using a car around Florence is not advisable, as there is little parking, many streets are pedestrian only and streets are often one-ways. A fleet of small electric buses also provide links between main key areas in the centre. Train – The nearest station is ‘Firenze Campo di Marte’ (400 meters from the stadium): upon exiting the station continue along Largo Gennarelli until the traffic lights. For those arriving at ‘Firenze Santa Maria Novella’ station it is suggested to take a train heading towards ‘Campo di Marte’ station. If you’re already in the city center, don’t bother with a train because by the time you’d walked to Santa Maria Novella you’d already be at the stadium if you’d just gone in the other direction. Florence’s neatly built stadium was inaugurated in 1931. The ground, located east of the city centre very close to Florence’s Campo Di Marte station, is built entirely of reinforced concrete with a 230 foot tower named the ‘Tower of Marathon’. Redevelopment for the 1990 World Cup involved removing the running track and increasing the seating capacity which is now over 47,000. The lack of a running track means that the view and the atmosphere are among the best in Italy. The Viola Ultras who congregate on the CurvaFiesole are fiercely anti-Juventus. Check the Serie A fixtures when planning your football trip to Italy for latest fixture information. Tickets for games are usually available about one week before the game. Games for the Italian League, called “Serie A,” are usually played on Sunday afternoons at 3 p.m., although due to scheduling problems you’ll find the odd game on Saturday, Sunday, or even Wednesday nights. You can find the schedule here. Tickets are sold in some Tabaccherie (tobacco shops), we got ours from one near the ground which was found after a little wandering. In the city centre try box office in Via Alamanni near the train station, or at the little sports bodega, Chiosco degli Sportivi, in a small piazza off of Piazza Repubblica (via degli Anselmi). You’ll need a valid ID to be purchase your ticket, as your name is printed directly on your ticket. It’s best to bring your passport, as a driver’s license or student ID is generally not accepted. You can also buy tickets online. 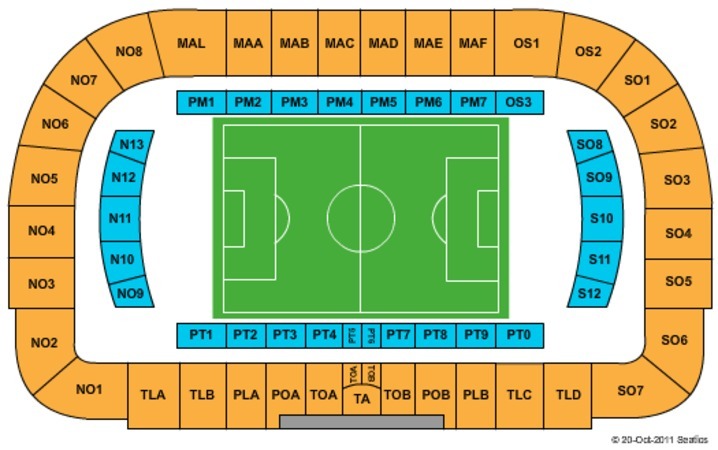 Ticket price depends on the type of game (regular season, the special national competition Coppa Italia or Champions League/UEFA) and the area you sit in. Prices can range from €10 to €120, but most ticket prices will be in the €10 to €40 range. Fiorentina’s ultras stand on the Curva Fiesole – Tickets here are usually really cheap, but sell out quickly and don’t respect the assigned seating. Football Trip to Florence – Where to stay. South of Santa Maria Novella – If you’re on the cheap, this is a pretty logical place to stay. It’ll probably take you about 5 minutes to get over here from the station and then about 10-15 minutes to get pretty much everywhere else in the historic centre. Football Trip to Florence – What else to see & do. The Football Museum (Via Aldo Palazzeschi 20) was founded to represent all things related to the world and culture of football, including its uniforms, economics, politics and important historical events. Relics, documents, and pubblications related to the history of football and especially to the victories of the Italian National team in the World Cups of 1934-1938-1982-2006; the European Cup in 1968 and at the 1936 Olympics. The museum is organized as a multimedia experience in which information, images, films and soundtracks are gathered in a data bank placed at the disposition of visitors. Opening hours: Monday-Friday: 9am-1pm and 3pm-7pm, Saturdays: 9am-1pm, Entrance: €3.00 and €1.50 for children between the ages of 6-14, Free for children 5 and under. Florence’s most famous square is Piazza della Signoria, the heart of the historic center and a free open-air sculpture exhibit. The Loggia della Signoria holds some important statues including a copy of Michelangelo’s David. The piazza has been Florence’s political center since the middle ages and Florence’s town hall, the medieval Palazzo Vecchio, sits on the piazza. For a budget-friendly way to visit Galleria dell’Accademia, try investing in a Firenze Card, which remains valid for 72 hours, covers admission to 60 museums, galleries (including Galleria degli Uffizi), historical villas, and gardens, and includes a three-day transit pass — great for taking cheap, scenic rides around the city. While the $95 (72 euro) price tag might seem a little steep, keep in mind that most of the included museums charge between $19-$26 (15-20 euros) each and you can now visit 60 of them over a three-day period. You’ll also have access to a separate, shorter line for Firenze Card holders. No trip to Florence is complete without a look inside the Basilica di Santa Maria del Fiore, one of the most easily recognizable landmarks in the city. Fortunately for budget travelers, admission to this 13th century gothic cathedral is free (although you can pay about eight euros per person to climb the 463 steps of Brunelleschi’s dome for sweeping views of the city or opt for the all-inclusive $13 ticket that lets you tour the Galleria dell’Opera di Santa Maria del Fiore, Brunelleschi’s Dome, Giotto’s Bell Tower, the Baptistery of San Giovanni, and the Crypt of Santa Reparata). The Baptistery of John the Baptist, from the 11th century, is one of Florence’s oldest buildings. Its exterior is made of green and white marble and has three sets of amazing bronze doors (reproductions – the originals are in the Duomo Museum, also worth a visit). Inside, are mosaics and a marble pavement of the zodiac. In Piazza San Giovanni, off Piazza del Duomo, open 12:00-7:00 daily except holidays and 8:30-2:00 Sundays (ticket). Santa Croce, in Piazza Santa Croce, is the largest Franciscan church in Italy and holds the tombs of several important Florentines including Michelangelo and Dante. The vast interior contains some exceptional stained glass windows and frescoes. One of Brunelleschi’s most important works, the Cappella dei Pazzi, is in Santa Croce. Admission includes the museum and tours given by volunteers when available. Audio tours are extra. Open Monday-Saturday, 9:30-5:30 and Sunday, 1-5:30. For a change of pace, take a ride on the #12 or #13 ATAF bus (tickets cost about $1.60 per person and are valid for 90 minutes) from the Santa Maria Novella train station to Piazzale Michelangelo for amazing panoramic views of Florence from the top of the hill. You’ll get a beautiful 20 to 30-minute ride over the Arno River through the Florentine countryside to a scenic square overlooking the city. The Red Garter (Via de’ Benci, 33/) – American-style sports bar with some of the best deals on beer in Florence. A two-level room features long picnic tables with a DJ booth and a dance floor that inevitably becomes the main event. With more than 50 years history behind it the Red Garter was born as one of the first American bars in Italy and is today one of the most famous nightspots in the city, well known even overseas. Angie’s Pub (Via dè Neri, 35/r) – Creativity runs wild at Angie’s Pub, an artsy and alternative watering hole with the abstract aesthetic of a lounge and the rowdy vibe of a neighborhood pub. Libreria La Cite (Borgo San Frediano,) – a library bar and jazz lounge, if you’re looking for a quiet place to talk and grab some drinks without distractions, there’s no better place in Florence than La Cite. The Lion’s Fountain (Borgo degli Albizi) – Irish pub known for its rowdy crowds and cheap drinks. Travelers and students from the U.S. will feel especially at home on Monday Dollar Nights and College Wednesdays. PopCafé (Piazza Santo Spirito 18/A r) draws an active, health-conscious and bohemian clientele. Centrally located in Florence’s famous Piazza Santo Spirito, PopCafé boasts great food and drinks at reasonable prices. For those looking for sustainable yet budget-friendly options in the city, this café offers lunch, brunch and an aperitivo buffet at a bargain. Kitsch (V.le A.Gramsci 5R) – Situated just inside the centro storico on the angle of Piazza Beccaria, there is no doubt that this already over-patronised bar would be even more rammed if it was positioned more centrally. Aperitivohere is unmatchable in Florence for quality and quantity with a range of cold and hot dishes(served by the in-house chef! ), and for the few remaining smokers in Florence, there is a covered(and in winter, heated) seating area located directly outside where you can sit to enjoy your food. REX Café (Via Fiesolana) – REX is currently celebrating 15 years of success and it is easy to see why. This place boasts some of the finest bar staff in Florence whose experience and skill pay credence to the exceptional drinks they serve. Zoe (Via dei Renai) – Open all week, early evening till late, you can find good music, a great crowd and excellent service. Angels (Via del Proconsolo, 29/31R) – A fabulous variety of music brought by a variety of regular DJs, a chilled international crowd. Antico NoÃ¨ (Volta San Piero 6/r) – Five Euros will buy you the most delicious sandwich of your life. Pugi (Piazza S. Marco, 10) – This is a pizza place right in San Marco Piazza. It is the best “to go” pizza in the city if you ask me and, understandably, it is always packed. Gustapanino, (Via dei Michelozzi 13r) – Three or four Euros will buy you a delicious panino or piadina (one is a sandwich the other more of a wrap) full of fresh, traditional Italian ingredients like olive pesto, pecorino, truffle cream, sun-dried tomatoes and a variety of cured meat. Osteria di Benci, (Via de’ Benci 13r) – This place has some really unique and delicious pasta dishes with nice outdoor seating and tons of room if you are a bigger group. Pizzeria Antica Porta, (Via Senese, 23) – Recommended for its pizza. Sant’Ambrogio Trattoria ‘Rocco’ – (Piazza Ghiberti/ Piazza Sant’ Ambrogio) – Hungry market shoppers and loyal local patrons sit on benches behind glass partitions happily sharing tables with strangers. The menu varies daily with a selection of 3 first plates and 3 second plates. It is true ‘homestyle’ cooking as attested by my Italian chef and friend Andrea and it is served up fresh and plentiful. Menu selections get crossed off as they run out. You can take 1st or 2nd plate menus plus dessert. House wine is self-serve from the jug in the middle of the table. The eclectic eating experience is just as satisfying as the shamefully low prices. Right between the Cathedral and the Piazza della Signoria (the square with the statues), is the Cantinetta dei Verrazzano. It looks like a baker’s shop as you walk in, with fresh bread and tempting cakes on display, but towards the back of the shop where they have a huge bread oven, they serve excellent filled foccacia bread. If you feel like a glass of wine with your food, the Verrazzano family have been making it at their castle for over 800 years, so it’s a great place to taste some local red wine. Just off the Piazza della Signoria is Cernacchino. Here they serve home made traditional Tuscan specialities in hollowed out crusty bread rolls. If you have a big appetite to satisfy, try a slow cooked beef stew or one of the rich vegetable soups. I Due frattelini, (Via dei Cimatori 38R) – This is a famous sandwich shop run by two brothers near Piazza della Signoria, you will know you’re in the right place by the long line of people waiting for their 2.50 Euro paninos and cheap glasses of wine. Gusta Pizza, (Via Maggio 46R) – A local favorite near Piazza Santo Spirito, this is one of the best pizzeria’s in town and for a cheap price, think €5-€8 euros per pizza. Closed on Mondays. Osteria il Buongustai (Via dei Cerchi) – The same three ladies make lunch every day and you can see them working their magic when you walk in. Prices range from €5-€8 euros for a primo piatto. Vinaino (124 via Palazzuolo) is just near the main train station, and has not changed much in a century – though the quality of the wine has definitely improved – and you can feast off a steaming plate of homemade tagliatelle smothered with fresh porcini mushrooms or a rich wild boar sauce.